Internet Password Lock is a software program for Windows 2000/XP/NT/Vista computers (does not work on Windows 95/98/Me) that allows you to restrict Internet access. This allows you to control Web browsing and surfing, Instant Messaging, and email. Parents can use Internet Password Lock to protect your children by making sure children do not use the Internet without a parent present. Businesses can use Internet Password Lock to lock out unauthorized Internet use. Once Internet Password Lock is installed, all Internet access will be blocked when Windows starts. To access the Internet, you must view the main Internet Password Lock screen by clicking on the Internet Password Lock icon on the system tray and then input a password (selected by you when you install Internet Password Lock). You can then access the Internet freely until you lock the Internet again using Internet Password Lock. 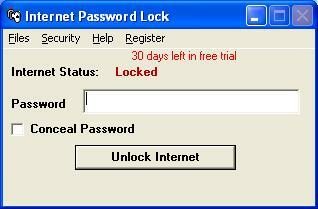 Internet Password Lock is available as shareware ($20 individual fee, with volume discounts available). Try it for a month to see if you like it before you have to pay for it. Just download the install file to your computer, then run the file like a program by double-clicking on the install file in Windows Explorer or My Computer to install Internet Password Lock. Remember that complete instructions are provided for uninstalling Internet Password Lock if you decide that you do not like it. Internet Password Lock runs on Windows 2000, XP, and Vista. Click here to download the installation program (iplarc.exe).